Although the rituals of Christian baptism ceremonies may vary by denomination, they all celebrate the introduction of a little boy or girl into the family faith. Naturally, a special day deserves a special party, so we’ve collected 42 creative baptism party ideas to help inspire you to plan the perfect celebration with family and friends. From dessert and food ideas, to DIY cross centerpieces and personalized favors, you’ll find a range of baptism party ideas that your guests—and camera—will love. Once you start planning your theme, color and party design, don’t forget to choose an adorable newborn photo of your little one to add to your baptism party invitations. If your child loves Winnie the Pooh and Tigger too, use these iconic characters in your baptism party decor. Take a step beyond a themed cake and add character descriptions around your tablescape to get the children excited about eating all of the colorful veggies. Frame adorable quotes and place them around the room at your baptism party. This “You Are My Sunshine” framed quote paired with fresh flowers adds brightness and color to the room. Suspend white crosses from decorative branches to create a simple yet lovely centerpiece. Your guests will admire the creativity and will love that they can still see the other guests across the table. Bring the animal kingdom into your baptism party with cute animal macarons and cookies. This display in a Noah’s Ark is almost too adorable to eat! If your child is being baptized in the fall, use classic autumn snacks and decorations, like ears of corn and brightly colored leaves. A rustic wooden board lettered with a Psalm makes an appropriate decoration for a picnic-themed food table. Display with picnic baskets, white flowers and delicious treats to bring the whole theme together. Host a garden-themed baptism party with natural-looking elements represented throughout the decor. Stick with a classic white tablecloth and cake to emit a fresh and clean feel while also adding touches of greenery to make your theme pop. Thank your guests for “bee-ing” at your child’s baptism with miniature jars of honey and matching honey dippers. They’ll get a kick out of the creative pun! Get creative with a cross-shaped photo display at your baptism party. Choose a variety of your favorite pictures of your little one and display them in a central location at the party. To create more of a nostalgic look, print the pictures in black and white. To make a cake pop favor that’s perfect for your baptism party, attach a personalized label with a baptism quote or saying such as “God Bless.” If you want to take it a step further, attach a miniature white cross with a ribbon. Can’t decide on one color? There’s nothing wrong with combining a variety of colors in your decor. This dessert table nicely ties together pink, teal and gold to create an inviting color scheme. For a fun addition to the kids’ table at your baptism party, write the names of your little guests on a kraft paper table runner. To keep them entertained, you can even give them markers so they can draw on the paper tablecloth themselves. For a party theme drawn from The Little Prince, use classic drawings of the fox, sheep and the little prince himself as inspiration for your cupcake toppers. Personalize sweet, healthy parfaits of granola, fruit and yogurt with monogrammed wooden spoons. Your guests will love this as an alternative to heavy desserts! If you want to throw a whimsical-themed baptism party for your little girl, use soft pastel colors throughout the decor. This elegant cake features intricate pastel pink flowers that fit the theme perfectly and look stunning against the white frosting. If you’re planning on using a classic white color scheme, try adding a pop of gold for contrast. For inspiration, take a look at these white balloons splattered with gold paint. Create an impressive backdrop with simple materials! You can create this heaven sent scene with fluffy material for the white clouds, sheer white fabric and white poster board for the letters. Noah’s Ark is an adorable theme idea for your baptism party. Try making fun centerpieces that feature an ark filled with animals. Just remember to keep the centerpiece small enough so your guests can still see across the table. Ice cross-shaped sugar cookies to match the baptism party color scheme. You’ll only need one drop of food coloring to create a soft pastel color fit for a baptism party. For a tasty and easy-to-make baptism spread, try creating a brunch food table filled with bagels, yogurt, croissants and more! Get inspired by the popular Footprints in the Sand prayer to create a dreamy beach-themed baptism party that will impress your guests. Head to the local craft store to pick up glass jars and other decorative elements to make these beautiful favors. If you live on the coast, add sand from your local beach for a local tie. If you love all things pink, create a dessert table for her baptism that features pink rose decor. Pops of greenery in your flower arrangements will bring your table to life! You can never go wrong with a monkey-themed baptism party! Surprise your guests with personalized chocolate bar favors with your son or daughter’s name on them or your favorite baptism verse. Create an elegant tablescape for your baptism party by using white as your base with color in your flower arrangements and lights. A textured tablecloth will provide an added layer of definition to your tablescape. Give your guests a sweet treat to take home after the baptism party by handing out cupcakes in a glass cloche as their favor! For a delicious baptism party dessert that perfectly commemorates the day, create chocolate-covered cake pops decorated with a white icing cross. Use antique items within your decor for a rustic feel. This globe and treasure chest adds a nice touch to the favor and gift table. Burlap bunting adds a nice touch to an outdoor baptism party. Pair it with matching burlap baptism party favors to add to the rustic theme! Add custom stickers to the favors of your choice to instantly tie them to a baptism party theme. These miniature jars are personalized with the baby’s name and baptism date, which is an adorable way to share a meaningful keepsake with your guests. Create an eclectic and memorable party for your newly baptized little man by decorating your dessert table with mustaches and serving mustache-shaped cookies. Celebrate your little one’s baptism by throwing a magical forest-themed party! For the centerpiece, color large branches with gold spray paint and hang clear ornaments with pink tissue paper inside. Tall centerpieces will look extravagant and don’t get in the way of your guests view across the table. Using a pop of color amongst gray and white tones will create a clean and simple color scheme. If you’re sticking with traditional colors, choose blue or pink tones as your pop of color on your cake, tablescape and favors. Bake favors that your guests can eat! These brown and white crown cookies are the perfect royal treat. For a delicious individual-sized dessert, serve crème brulee in shot glass. The dessert fits in perfectly at baptism party with a white color scheme. Show your guests how much you appreciate them coming to your child’s baptism by giving them kisses from your baby as party favors. Give your guests an adorable takeout box filled with treats as a thank you for celebrating your child’s baptism! DIY party decor will add character to your baptism party! These beautiful and bright hanging paper angels add a pop of color to the white branch centerpiece. 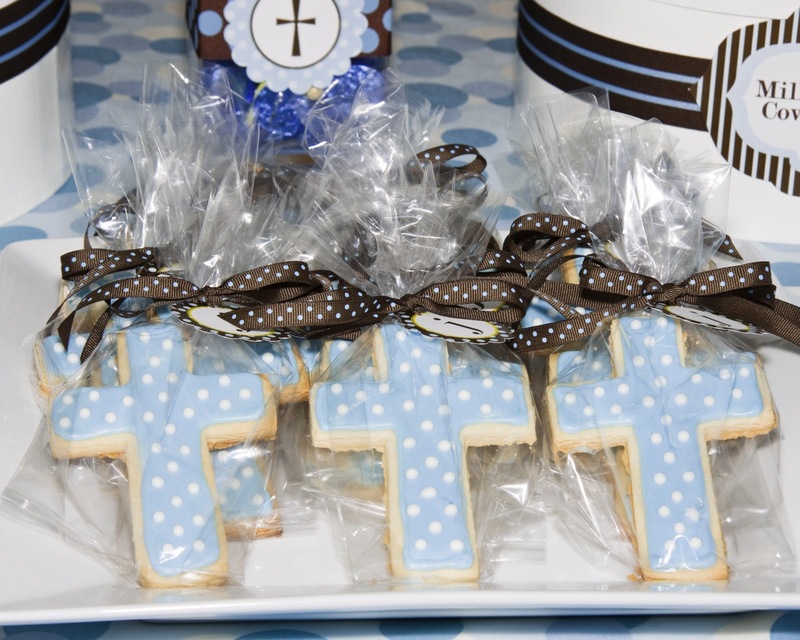 A cross-shaped cookie is a wonderful baptism favor. For a creative twist, decorate the cookie with fun patterns, like polka dots. Place your favorite baptism quote or message such as “Child of God” into mason jars to create fun favors for your guests! To create an elegant baptism party that your guests will adore, use white and gold elements throughout your decor. This dessert table styled by Sweet Society nicely ties together gold-sheened white chocolate strawberries and tasteful candies for a display almost too beautiful to eat. Doves symbolize the Holy Spirit that the newly baptized receives. This symbol of purity can be tied into the decor in many ways at your baptism party. At this baptism party styled by Maddy K, the cake featured two doves perched beside an unhatched egg—an adorable way to incorporate the sacred symbol.